Samsung India is running a nationwide television and digital campaign showcasing its initiative to take customer service to the doorsteps of consumers in the hinterlands. 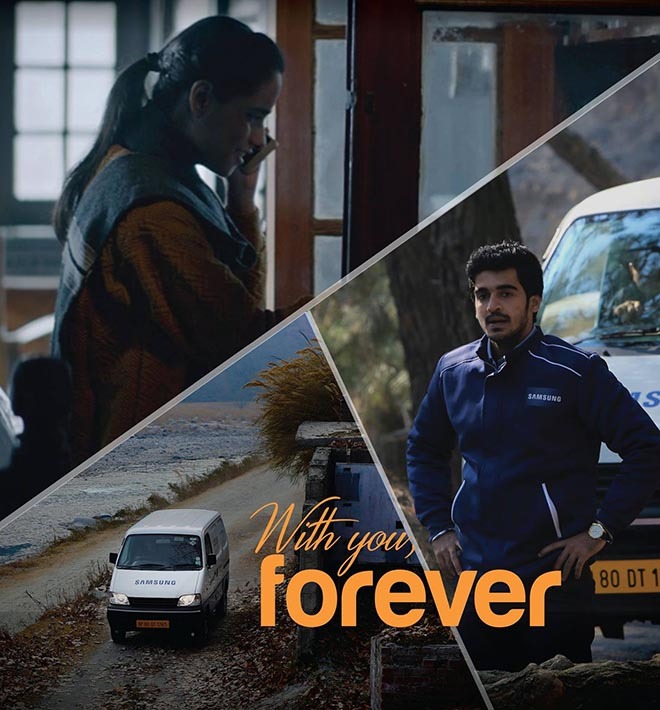 The campaign film #SamsungService follows Amit (Abhishek Jain), a Samsung customer service engineer on his way to a remote call-out made by a young woman (Drishti). Arriving at his destination after many trials and tribulations, Amit is surprised to find that he is at a hostel for the blind, and that his work has allowed the blind children of the hostel to support their housemate who is participating in a reality singing show on TV. The voiceover: “At times one must venture a little further than usual for the sake of relationships. That’s why Samsung service vans go to every corner of the country”. Launched on Youtube on December 30, the online film has been viewed over 56 millions times. The Samsung Cares campaign film is being shown on 50 television channels and is supported by print and digital elements. “In the last 21 years in India, Samsung has grown to become the largest consumer electronics and mobile phones brand in India. With a wide portfolio of products that are sold across India through more than 150,000 retail outlets, Samsung also has a strong pan India service network. Our new initiative of expanding to rural India, right upto the taluka level, helps us in taking care of our valued customers, wherever they are. The new campaign video gives a glimpse of yet another initiative towards our ‘Make for India’ commitment. We are very happy to receive an overwhelming response from consumers across India, who have given a big thumbs up to the campaign with around 13 million views on YouTube in just 96 hours,” said Ranjivjit Singh, Chief Marketing Officer, Samsung India. The Samsung Cares campaign was developed at Cheil India by chief creative officer Sagar Mahabaleshwarkar, executive creative director and copywriter Tarvinderjit Singh, account managers Kundan Joshee, Mohit Mishra, Subhransu Adhikari and Vandana Bhalla, planners Ayan Banik and Tanvi Arora. Filming was shot in Manali and Kullu by director Anupam Mishra via Crazy Few Films, Mumbai, with director of photography Rubais, producers Urfi Kazmi and Viraj Gawas. Editors were Shyam Salgaonkar (Sally) and Sanjay Mali at Prime Focus. Colourist was Nicola Gasparri at After Studios. Music, composed by Dhruv Ghanekar was performed by Mohit Chauhan.